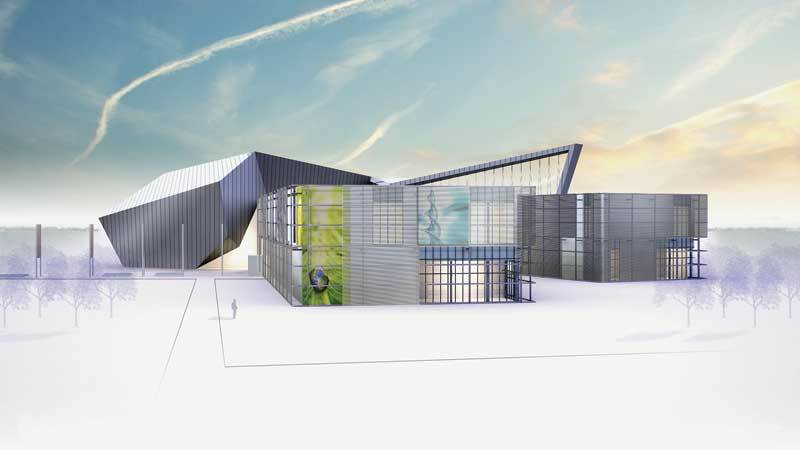 After 44 years at its 11th Street SW location, Calgary’s science centre has moved due to a lack of expansion space. The new Nose Creek Valley site allows room for a facility that is double the size, and has room for expansion. However, the new site presented challenges for designers. It is in line with the main north-south runway at the Calgary International Airport, and the planes that land heading north fly over the site at a low altitude. (For another look at the Calgary International Airport, see “LEDing by Example,” by Shirley Coyle, LC, in the March 2011 issue of Construction Canada. Visit www.constructioncanada.net and select “Archives.”) The location is also adjacent to Deerfoot Trail, a major freeway route through Calgary, and the Canadian Pacific (CP) Rail line. A right-of-way for a future light rapid transit (LRT) line is also located immediately adjacent. 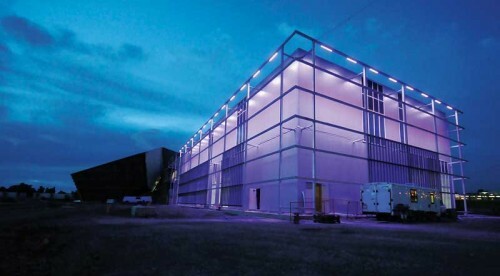 To meet owner requirements and exceed minimum noise isolation requirements, the building envelope needed to provide sufficient noise isolation from all these noise sources. The new location is in the airport vicinity protection area and, at a minimum, must meet the requirements outlined in Alberta Building Code’s (ABC’s) Division B Part 11, “Exterior Acoustic Insulation,” for noise isolation properties of the exterior building envelope. The protection area is a designated zone around the airport where there has been noise exposure forecast (NEF) contours determined. These are concentric lines around the airport runways that provide an indication as to the average energy equivalent noise level at a distance away from the runway. Higher NEF values are located closer to the runways, with the values decreasing as they move away. The first step was to determine where the building site lies with respect to the noise contours. 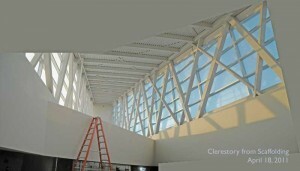 The science centre atrium clerestory glass installation on November 8, 2010. The interior light of all exterior insulating glazing was upgraded to 6-mm (0.2-in.) thick laminated glass to increase insulation from outdoor noise. The science centre is situated on the 35 NEF contour. ABC Chapter 11 outlines the acoustic insulation factor (AIF) that must be met by the building envelope based on the site’s NEF contour value––a site located in a higher NEF zone requires exterior building envelope assemblies with higher AIF ratings. Another factor that was considered related to acoustics insulation is the use of the building’s rooms. For example, spaces used for sleeping required a higher AIF rating than a meeting room. ABC provides AIF values for various exterior wall, window, and roof assemblies. Additional AIF values can be determined from sound transmission loss values of tested assemblies. The other variables determining the required AIF value were the amount of exterior wall and window area compared to the floor area of the room, and the number of different exterior wall components making up the room’s exterior envelope. The rooms with the highest AIF requirement in the facility are the classroom areas and those used for teaching purposes––such as the Presentation Theatre and the Dome Theatre. The gallery spaces did not require as high an AIF value to meet ABC requirements. 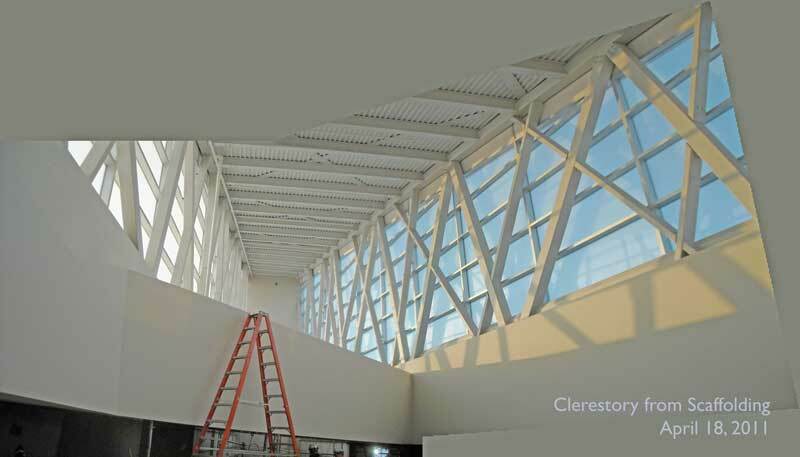 An interior view of atrium clerestory glazing. The methodology outlined in ABC Division B Part 11 is based on Canadian Mortgage and Housing Corporation’s (CMHC’s) 1981 guide, New Housing and Airport Noise. It offers guidance on how to provide building envelope assemblies with higher noise isolation properties for buildings located closer to airport runways. By following this strategy, rooms became usable for their required purpose, but that still does not mean aircraft noise will not be heard inside the science centre. Type 3 Wall––prefinished metal panel, panel support clip system and air space, 75-mm (3-in.) semi-rigid insulation and metal Z-bars, air/vapour barrier membrane, 13-mm exterior gypsum sheathing, 92-mm (3.6-in.) or 152-mm steel studs, and steel framing. The main gallery areas have suspended radiant cooling panels and suspended radiant heating panels along the exterior walls that do not provide additional noise isolation properties to the roof assembly. Some rooms, such as classrooms, have suspended T-bar ceiling systems with mineral fibre tiles. The classrooms have more windows and skylights than other areas of the building. 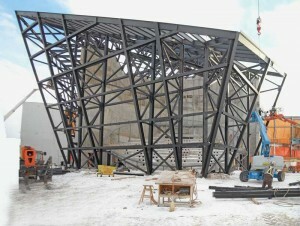 Dome Theatre structural steel installation on December 14, 2010. There is also a raised section of the science centre over part of the central atrium and main stairway with clerestory windows. The windows are double-glazed insulating units with 6-mm glass, 13-mm air space, and 6-mm glass, mounted in thermally broken aluminum curtain wall type frames and are relatively lightweight. The initial aircraft analysis indicated upgrades were required to the originally proposed assemblies to meet minimum ABC requirements. The upgrades included a 125-mm (5-in.) thick concrete topping on the metal deck roof, and the addition of a metal stud and gypsum board layer for the top half of the walls. One of the window panes was upgraded from 6-mm glass to 6-mm laminated glass. These upgrades were sufficient to meet minimum ABC requirements, but did not necessarily meet the science centre’s needs regarding the audibility of aircraft noise within the building. An artist rendering of the building, view from the south. Of particular concern was the science centre’s Dome Theatre, as this space had a very low background noise criteria (NC) design requirement. The target was a maximum NC of 25. This theatre has a dome screen with three-dimensional (3-D) video capability and high-quality surround sound. The originally proposed metal roof and wall system for this space would not have provided the required noise isolation properties, even with a 150-mm thick concrete topping. To obtain the required noise isolation, an inner resilient-mounted gypsum board ceiling and wall were required. The Dome Theatre has a sloping roof and walls; the solution for applying concrete to these walls was to use shotcrete––a spray-applied concrete.